In an effort to extend a helping hand to Pasadena ISD families, several non-profit organizations received $25,000 in grants to benefit the district after being selected as a high performing Internet Essentials School System. The grant will extend the use of Internet access beyond classrooms and into the homes of students and their families. 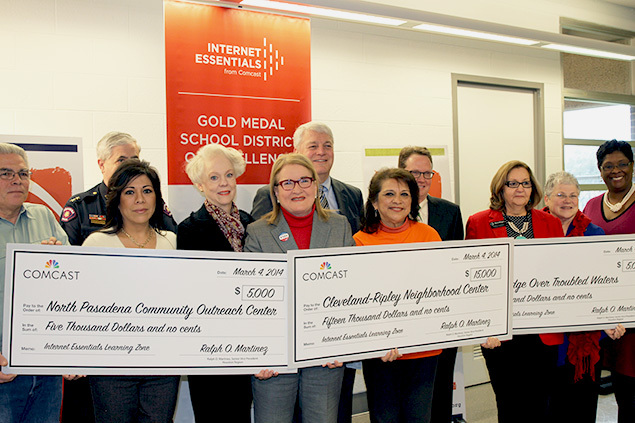 Pasadena ISD is one of only 15 school systems nationwide selected to benefit from an Internet Essentials Learning Zone grant as recognition for connecting numerous families to the home broadband adoption program, a low-cost internet initiative operated by Comcast. 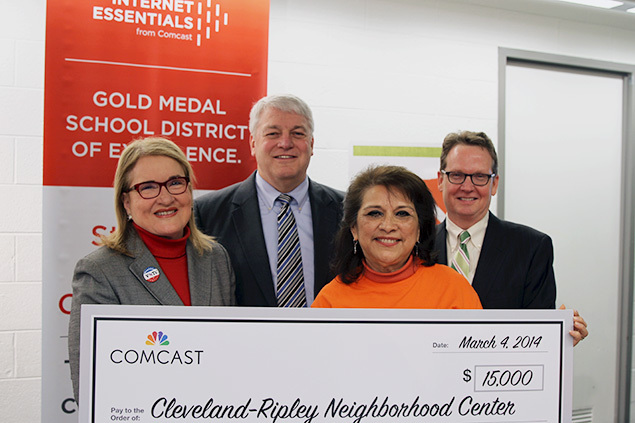 “We want to thank Comcast, all of our wonderful community partners and our parents for supporting our students and making this possible,” Superintendent of Schools Dr. Kirk Lewis said. With the Internet Essentials program, Pasadena ISD families will have free access to computers and Internet services through community organizations along Fairmont Parkway including Neighborhood Centers, Inc., Bridge Over Troubled Water and the North Pasadena Community Outreach Center. The grant has been distributed to these organizations to fund the digital learning initiative. Essentially, Internet Essentials is a computer lab of connectivity for the community. “The grants in Pasadena will enable these community partners to create a continuum of connectivity or ‘Internet Essentials Learning Zone’ that begins in the classroom with wired schools, follows the students to wired libraries, computer centers, after-school programs and ends in wired homes when the day is over,” Ray Purser, vice president of government and public relations at Houston Region Comcast Cable, said. School district officials were eager to have Comcast come on board to further boost the district’s 1-to-1 technology initiative, which equipped nearly all seventh and eighth grade students in the district with brand-new netbook computers. Internet Essentials is also available at a low monthly cost to households with students who participate in the National School Lunch Program. Families will have the option to purchase an Internet-ready computer and gain access to free digital literacy training. Additionally, Pasadena ISD students in Internet Essentials households can qualify for six months of complimentary Internet access if they apply between March 5 and March 18. The good news did not end there. 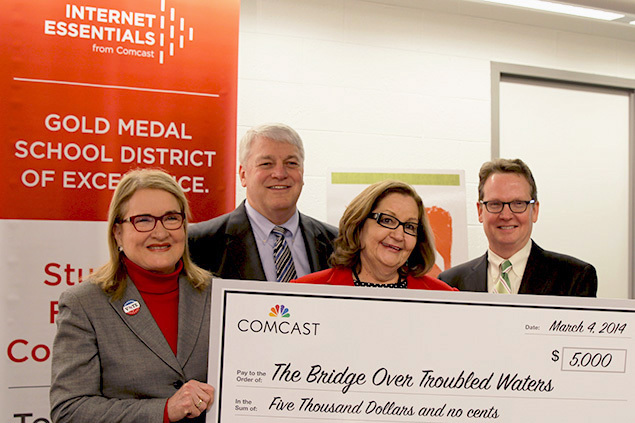 Comcast also announced that the Internet Essentials broadband adoption program will continue for students indefinitely. When Comcast launched Internet Essentials in 2011, the program was expected to last no more than three years. Purser said district leaders and community partners were instrumental in making this opportunity possible for students. 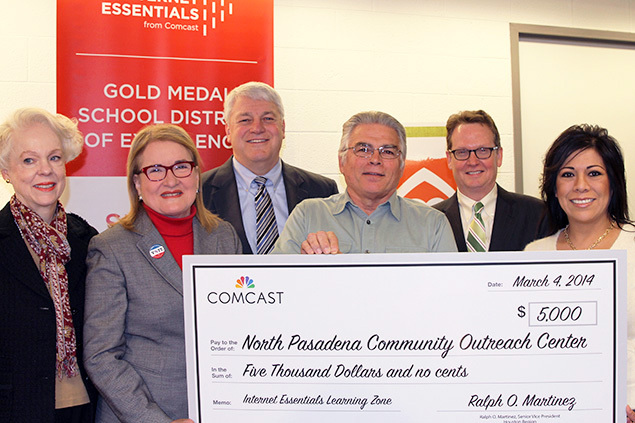 Comcast awarded $25,000 in grants to community partners in Pasadena to launch an Internet Essentials Learning Zone on behalf of Pasadena ISD. With the Internet Essentials program, district families will have free access to computers and Internet services through non-profit organizations located along Fairmont Parkway including Cleveland-Ripley Neighborhood Centers, Inc., Bridge Over Troubled Water and the North Pasadena Community Outreach Center. Pictured here (from left): Bill Miller, North Pasadena Community Outreach Center, Maria Torres, North Pasadena Community Outreach Center, Assistant Police Chief M.P. Jackson, Pasadena, Lynne Hooper, North Pasadena Community Outreach Center, Senator Sylvia Garcia, Superintendent of Schools Dr. Kirk Lewis, Margie Pena, Cleveland-Ripley Neighborhood Center, Ray Purser, Comcast vice president of government and public relations, Deborah Mosely, The Bridge Over Troubled Waters, Barbara Sitzman, City of Pasadena, Yolanda Green, Comcast.